I mention the book’s (ahem) ample nature to point out that it’s a serious volume, with a lot of recipes and a bunch of really good ones, to boot. One thing I love most, though, is the index. Arranged, in part, by main ingredient, it’s very handy. Want a gin drink? Find the Gin subheading and eat your heart out. It is, unfortunately, not cross-referenced, so if a recipe has, say, gin and rum, but rum is the main ingredient, you won’t find it under Gin. “Whazzawha? Recipe with gin and rum?” you sez? Well, yes. And it’s a good drink. Well balanced, with the rum and gin complementing each other rather than fighting. Saucier terms this drink the Baroque, but given the political season in the USA, I’m calling this, rather obviously, the Baroque Obama, although it’s the same recipe as appears in Saucier (although I’m converting his 1 part lime, 2 parts rum, etc. into ounces). I’ve learned very little about Ted Saucier. It appears he was once the publicist for the Waldorf-Astoria hotel in Manhattan, and he lived from 1896 to 1970, but beyond that, I’ve learned nothing. Except that I shouldn’t get excited and overbid on a cocktail book. OH, I almost forgot! There’s another reason Saucier’s book is so well-loved. I’ll share that tomorrow. i say you update the cocktail one more notch by replacing one of the liquors with ‘kumi kumi,’ the oft-poisonous homemade liquor popular in Kenya, not only to underscore Obama’s heritage, but as a nod to the twin decline of the US dollar and the Kenyan shilling. yummers! Both rum and gin in the same cocktail, while rare, can have a great result. Take the old Maiden’s Prayer, for example. Thanks for the Obama cocktail and a great blog! We are just discovering cocktail blogs and can’t believe we’ve been missing out on so much! Thanks! I worked for Ted Saucier in his PR office from February,1965 – May, 1966. He was quite an imposing individual. He was a very large man and loved to eat. We were in the process of putting together a cook book. I don’t think it was every published but I still have some of the recipes. 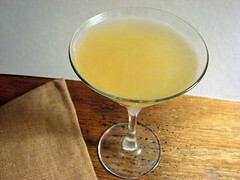 They are very classic – just like the recipes in “Bottoms Up”. While I worked for him, he did PR for a clothing store called Lynn’s. They sold very inexpensive clothes. His big account was Norway Sardines. It wasn’t as glamorous as he may have wanted, but it paid the rent. He lived in Manhattan with his wife and I don’t think they had any children. He also maintained a friendship with Walter Pigeon. Walter was in the movie “Week-end at the Waldorf”. Ted was a “technical advisor”on the movie. It seemed to me that he lived in the past and missed his days at the Waldorf. Hope this gave you some insight into the man. i am ted saucier’s grandson. his daughter was marguerite hayden (he and my grandmother divorced early on). he was born in montreal and is buried in montreal. he was a graduate of mcgill university.i was told that i met ginger rogers in 1945 at his apartment on park avenue-my response to her was to hide under the bed-what a dummy! ted was an excellent cook and had a commanding voice and presence. he was also an excellent writer . he published the sardine cookbook and was a friend of the king of norway..he also wrote “peacock alley” and a book about a brother-in-laws experience in world war II. he was very nice when you did what he wanted, but not so nice otherwise. i only saw him twice in my life but he has left an enduring memory of him. Derr, I am actually doing a seminar on Ted Saucier and would love to know more about his marriage to your grandmother. Could you email me direct from here? Thank you. So interesting to see this! Ted Saucier was my mom’s (Janet Horn, but originally, Janet Cartwright) uncle! I’m not sure of the lineage, which side of her family, etc. But I grew up LOVING that book because of all the wonderful naughty pictures in it! Derr Moser, if you ever come back to this and see my comment, please find me on Facebook or email me (bob@bobhornrealtor.com). I’d love to figure out our connection! If you want to know more about Ted saucier, check out his obituary in the new York times. It.s about 8to10 inches long which is quite unusual…a fairly big wig in NYC in the twenties,thirties and forties. This is all great information everyone; thank you so much.